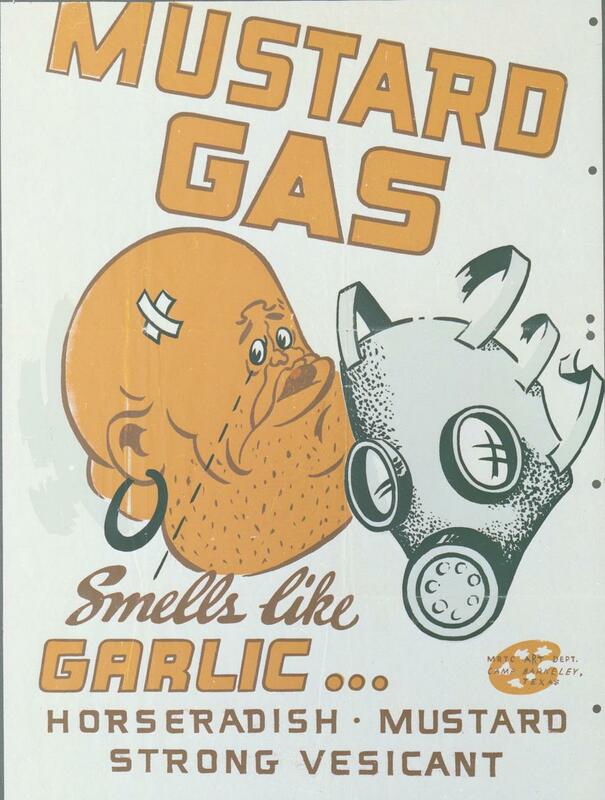 Chemical Weapons: WWII posters taught soldiers to identify gases by smell. These posters, produced by the Medical Training Replacement Center at Camp Barkeley near Abilene, Texas, were meant to teach soldiers about to enter World War II to recognize and treat the effects of chemical weapons. The advent of chemical warfare during World War I was traumatic, and the stories from the front of soldiers choking on gases were dreadful. Soldiers encountering these posters couldn’t have known that ultimately chemical weapons would play almost no part in World War II. The League of Nations’ Geneva Protocol of 1925 prohibited the use of chemical weapons, and while armies continued to produce and stockpile the agents, neither Axis nor Allies ended up deploying them. In the end, chemical weapons were used against civilians in concentration camps and in the 1937 Japanese invasion of Manchuria, but American troops didn’t encounter them in combat. The smells that these posters warn soldiers-in-training to be wary of are the everyday scents of home: flypaper, musty hay, green corn, geraniums, garlic. The choice of analogies seems particularly appropriate for soldiers raised on farms­—a population that would become increasingly small in every war to follow. Thanks to Eric Boyle of the National Museum of Health and Medicine. “C-60 MRTC Gas Identification Posters, Series of Four,” MRTC Art Department at Camp Barkeley, Texas, ca. 1941-1945. OHA 365: World War II Gas Identification Posters. Otis Historical Archives, National Museum of Health and Medicine.